On October 30, 2018, NIFLA led hundreds of participants in a free online training session for pregnancy centers. Tuesday’s live online training session focused on the top 5 legal threats to pregnancy centers and ways to protect against these threats in 2019. 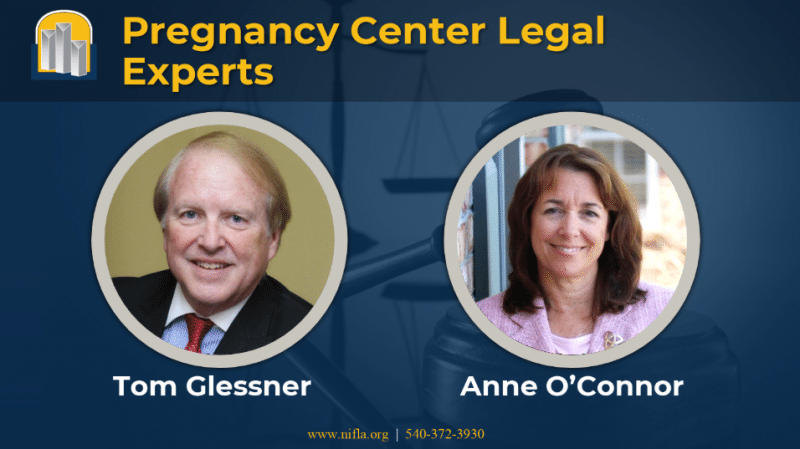 If you missed this special pregnancy center training from the legal team behind NIFLA v. Becerra, you can register to hear the recording here. The outline below contains highlights from this important presentation. This threat originally stems from a 1982 campaign led by Planned Parenthood which attempted to discredit America’s pregnancy centers. Although investigations into these allegations later proved them to be unfounded, abortion industry advocates still attempt to malign pregnancy centers as “fake” in the present day. Directly advertising or inferring that your center provides and/or refers for abortion. clinic and provide medical services when you are not. NIFLA recommends that all center advertising and website copy be straight-forward and honest. Member centers can refer to NIFLA’s February 2018 Legal Tips for more information about what is appropriate in website copy and advertising. supervision of a licensed physician. Practicing medicine without a license – i.e., providing medical services such as ultrasound confirmation of pregnancy without the oversight of a physician – is never appropriate or recommended. Medical malpractice could also include a lack of proper training for personnel or going outside the scope of nurse services provided by licensing guidelines. For more detail on these and other best practices, register to have your center’s medical staff attend NIFLA‘s Institute in Limited Obstetric Ultrasound. This valuable training can help member centers avoid these and other costly legal mistakes. In addition to avoiding the legal threats related to advertising and medical practice mentioned above, each center should ensure that their corporate paperwork, structure and procedures follow recommended guidelines. Failure to follow organization bylaws. 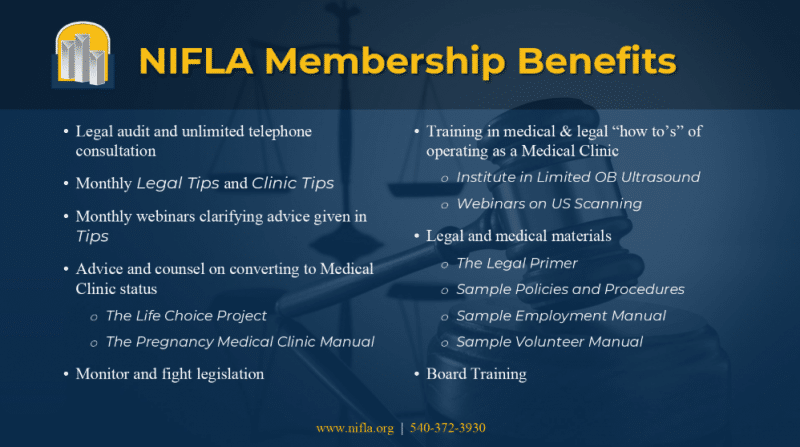 NIFLA membership includes support for corporate requirements and many other common pregnancy center legal needs. If you have questions about how your center can become a NIFLA member, please be sure to visit NIFLA‘s new members page. Careless employment practices could pose just as much of a legal threat to your organization from the inside as other problems could from the outside. Develop and maintain an employment manual. Avoid improperly firing employees and and triggering wrongful termination of employment lawsuits. Develop and maintain a conflict of interest policy. Hostile legislation that negatively impacts your center’s ability to serve women is more likely to be passed when pregnancy centers do not have enough active supporters in local and state government. 501(c)(3) tax-exempt charities may not endorse and/or oppose candidates for political office. NIFLA recommends that centers build personal relationships with local legislators. NIFLA also provides materials, news coverage and up-to-date statistics to help members raise public awareness about the many benefits pro-life pregnancy centers provide in America’s commuities. Leveraging NIFLA‘s unmatched legal expertise is a sure way to get ahead of these and other legal threats before they start. To learn more about why your pregnancy center needs NIFLA in its corner, please visit NIFLA‘s new membership page. 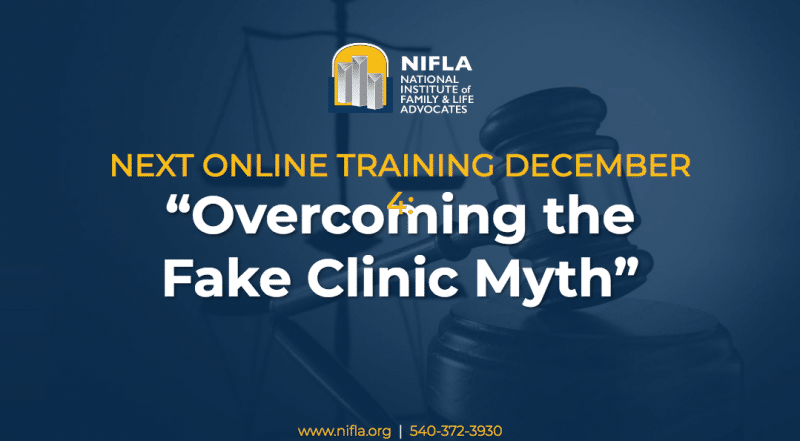 NIFLA‘s next online training will be held on December 4 and is titled “Overcoming the Fake Clinic Myth.” Stay tuned for more details, and we hope to see you there!